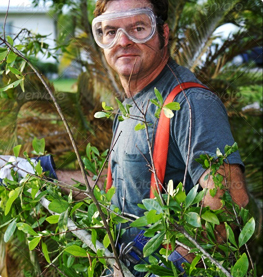 Tree stump removal and stump grinding is not always part of what we consider as a tree owner when removing our tree. Unfortunately tree stumps left behind from a felled tree can often get in the way of progress. Once you have had your tree dismantled you may also wish to look at your options for the extra space that you have acquired. Options that is not always available when a tree stump is left after Tree care work has taken place and your tree has been removed. At Al's tree surgery we concentrate on providing a safe and professional tree stump grinding and removal service. Utilising modern and efficient machinery, we can tackle any size stump, from just a few inches in diameter and upwards. We will grind stumps and surface roots below ground level to allow you to use your space for replanting, or for ground preparation for other uses such as paving, for extra outside storage or perhaps a new space for a children's playhouse or sandpit. Our Stump Grinding and Stump Removal service also ensures that any risk of a tree having regrowth after being cut is reduced and removed to the lowest it possible can be. Stump grinding can also be a much friendlier way to halt the regrowth from a Tree stump and roots, as quite often the alternative is to use a form of poison on the stump. Like much of the other aspects of arborocultural work, stump and root removals and the use of stump grinding equipment can be physically demanding and dangerous. It is always important to have an expert perform this type of work as your gas, electric or another major lines could be running through the area of removal. At Al's Tree Surgery we use only trained and competent staff to operate stump grinding machinery, to ensure the safest possible removal of your stumps as well as a clean and efficient stump grinding service. 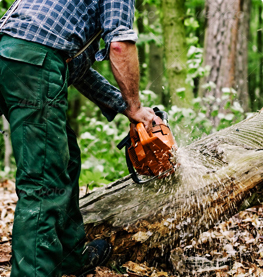 Our customers find the stump grinding service offered by Al's Tree Surgery useful as it is performed safely & quickly; allowing changes to be made as and when you would like them to happen, and is always offered at a competitive price.